between the tip and the mixing head. When the removable tips are used with an extension tube, they are made of hard copper, brass, or bronze. Tip sizes are designated by numbers, and each manufacturer has an arrangement for classifying them. Tip sizes differ in the diameter of the hole to obtain the correct volume of heat for the work to be done. HOSE. - Hose used to make the connection between a torch and a regulator is strong, nonporous, and sufficiently flexible and light to make torch movements easy. It is made to withstand high-internal pressures. The rubber used in its manufacture is specially treated to remove sulfur to avoid the danger of spontaneous combustion. Welding hose comes in various sizes, depending upon the size of work for which it is intended. Hose used for light work is 3/16- or l/4-inch-inside diameter, and it has one or two plies of fabric. For heavy-duty welding and cutting operations, hose with a 5/16-inch-inside diameter and three to five plies of fabric should be used. Single hose comes in lengths of 12 l/2 feet to 25 feet. Some manufacturers make a double hose that conforms to the same general specifications. The hoses used for acetylene and oxygen are the same in grade, but they differ in color. Oxygen hose is GREEN; MAPP-gas hose is RED. Use no oil, grease, or other lubricant on welding (or cutting) apparatus. Oil or grease in the presence of oxygen under pressure ignites violently! is the term that refers to a filler metal, in wire or rod form, for use in gas welding and brazing processes and certain electric welding processes when the filler metal is not a part of the electric circuit. A filler rod serves only one purpose; it supplies filler metal to the joint. Filler rods for steel are often coated with copper to protect them from corrosion during storage. Most rods are furnished in 36-inch lengths and a wide variety of diameters, ranging from l/32 to 3/8 inch. Rods for welding cast iron vary from 12 to 24 inches in length and are frequently square, rather than round, in cross section. The rod diameter selected for a given job is governed by the thickness of the metals being joined. Except for the rod diameter, the filler rod selected is 3-42 determined by military (MIL) specification on the basis of the metals being joined. Many different types of rods are manufactured for welding ferrous and nonferrous metals. 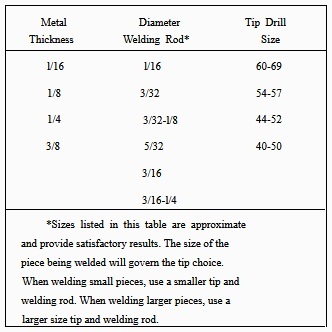 In general, welding shops stock only a few basic types that are suitable in all welding positions. These basic types are known as general-purpose rods. SELECTION OF TORCH TIP. - Welding torch tip size is designated by a number stamped on the tip. The tip size is determined by the size of the orifice. There is no standard system of numbering welding torch tip sizes; each manufacturer has a numbering system. In this manual, tip size instructions are provided in orifice "Numbers drill" size. Number drills consist of a series of 80 drills, Numbers 1 through 80. Once you know a manufacturer's torches and numbering. system, you rarely have to refer to orifice number drill sizes. Since the orifice size determines the amount of acetylene and oxygen fed to the flame, the orifice determines the amount of heat produced by the torch. The larger the orifice, the greater the amount of heat generated. For practical purposes with a balanced, pressure-type torch, use table 3-3.